Of course, if you are anything like me, the first thing you want to do is turn around and walk run away screaming. There is no clean dishes to cook with, and all my “bulk food” jars are empty. I keep the food in 5 gallon pails in my storage area, and fill the glass jars as needed. It makes it easy to grab what I want to cook/make/bake. But, alas! They were totally empty. So, we didn’t make food at home. We ate out. 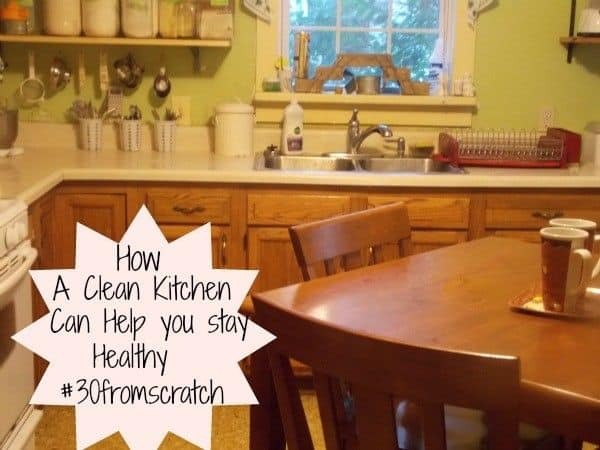 So, as part of the 30 Days of Scratch Cooking, I am going to help you focus on keeping your kitchen clean, and show you how a clean kitchen keeps you healthy! It took me almost an hour to get my kitchen looking like this and by that time, I wanted to just order another pizza! Having a clean kitchen will help you be in the right frame of mind to cook for you and your family, as there will be space to chop, slice, and dice as well as clean pots and pans to saute, fry, and brown. I find that if my kitchen is spotless before I go to bed at night, I wake up in a much better mood. Seeing that mess above didn’t make my day start off too well! So, grab your dishcloth and let’s get those kitchens ready to be used again! This next month will be full of fun recipes, tips, tricks and ideas to make you fall in love with your mixer all over again. I totally agree with you Dawn. But we have gone the other way. We moved into a older double wide manufactured home and the dishwasher is broken. Don’t have the money to fix it right now so I use it as a drying rack for clean dishes. When we had the dish washer I didn’t always use it, but at least I had that option. 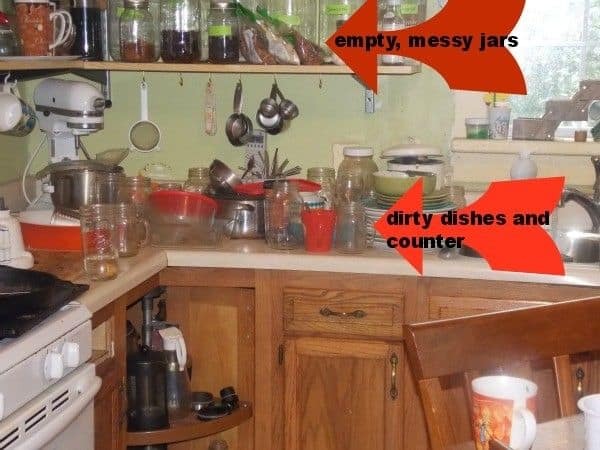 I am getting so frustrated with always having dirty dishes because I am trying to get so many things done in one day….anyway, I to am looking forward to being more organized and get things in order.